This is the official cover for Frostgrave:Wizard’s Conclave which is due out next February. Once again, Dmitry and Kate Burmak have turned in an exceptional piece of artwork, but for the moment, I want to focus on that text at the bottom. Although the full story is told in the introduction to the book, basically, one day I realized that years of working for Osprey Publishing had given me numerous contacts in the games industry, including many of the biggest names in wargame writing. I began to wonder what would happen if I asked them all to write a scenario for Frostgrave. Well, this is the answer - a big book filled with scenarios of every description, written by a ‘greatest hits’ type collection of games writers. I think it is something unique in the wargame world, and I feel very honoured that all of these people have had a crack at writing for my game. Now, back to that artwork for a second. 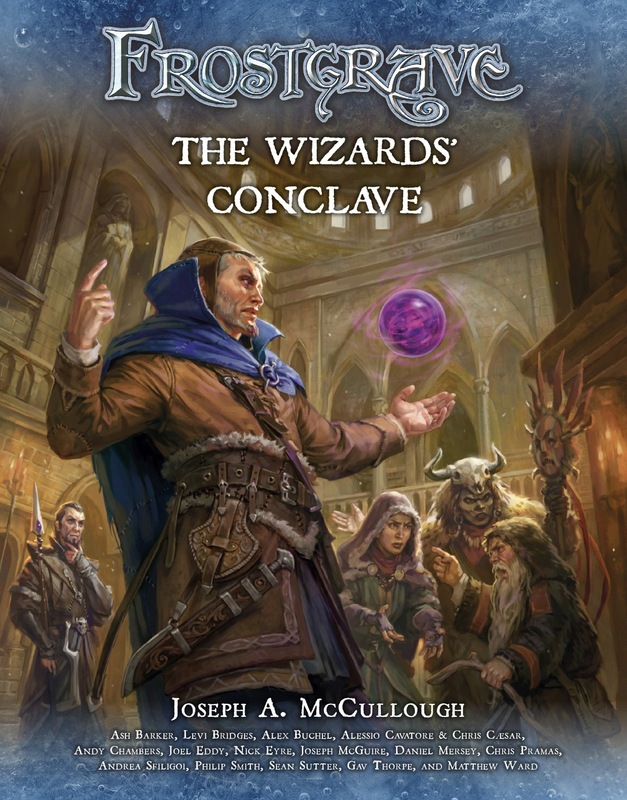 I’ve got a little prize for whomever can guess why those specific wizards are depicted on the cover. Put your guesses in the comments section below and make sure I can identify you. First one who gets it right gets a signed Frostgrave: Grimoire box. One guess per person. Employees of Osprey, North Star, and anyone who somehow already knows the answer are ineligible. Because all of their schools are aligned with each other and none is an opposed school to each of the above fellows. I'm going to guess that those 5 are reflecting your group (playtest group, friends, whatever you'd call your "regulars") that form YOUR conclave! Best that I start squirrelling away some pennies. I think it's the wizard types that some authors have played themselves. Lookout forward to the books. They are all the same wizard with different school ? They are the first 5 wizard types you created when first writing the amazing game called Frostgrave? They're the five wizards who left you with the bar tab? each wizard was released from NorthStar for a different expansion of frostgrave. Are they tournament winner's wizards? each school of magic is aligned therefore creating the conclave as each school needs the other to succeed in there quests. Are they Characters from all the Frostgrave fictional universe books (novels and short stories)? I was going to say what Leadpocalypse said, but he beat me to it! You are the soothsayer and the conclave is taking place at the North Star headquarters. Maybe the brainstorming session about future publications related to Frostgrave have not arrived to a peacefull end and your boss Nick Eyre (the necromancer) is waiting for you (the creator) to forecast the future with your cristal ball. In the meantime, other North star workers continue with their arguments. I love your job and I'm looking forward your new game. If sometime you come to Barcelona, please give a call. Despite the wisdom of many mages the conclave was unable to ascertain the function of a `disco ball'. They all think Elementalists are overpowered. They each were on the covers of the previous FG books. I'm on Fb as Johan Vaneecke. I don't recognize all those names, but the ones I do recognize are certainly some heavy hitters in the RPG and wargames industry. I'm super stoked to see what they came up with. What's the expected release date for this one? Rangers of Shadow Deep, Coming Soon!